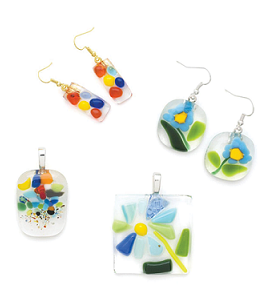 Learn the fundamentals of glass fusing in this two-part beginner course. This two-part course will introduce participants to proper kiln use while exploring various techniques to make unique and original jewelry and glass fuse pieces. Students will be supplied materials and handouts to make four pieces of glass fused art, using four techniques; full fuse, tack fuse, contour fuse and kiln carving. Part I is on May 13 from 6:30-9:30 pm. Part II is on May 20 from 6:30-8:30 pm. There is no seperate registration required for Part II. Registration fee includes all supplies. For CoG members, this course qualifies as the safety orientation for the glass and enameling zone. Ages 18 and up. To keep our classes affordable, we book our instructors and purchase materials in advance. We depend on advanced registration. Classes without sufficient advanced enrollment may be canceled. Advanced registration closes Thursday, May 9 at 6pm. Registrations made after this date will be subject to a 20% late fee. Regular registration closes Sunday, May 12 at 5 pm. Cancellations must be made a week prior to the class date in order to be eligible for a refund.